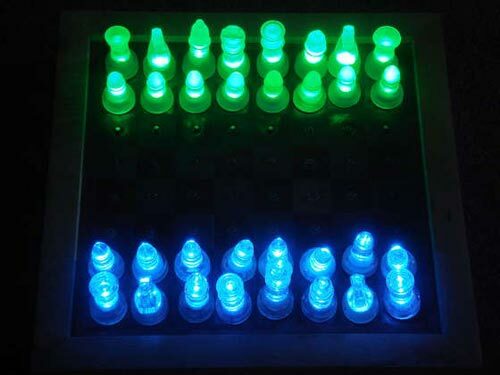 Check out this cool DIY LED chess set, it was made by Instructables member Tetranitrate. Sixteen blue LEDs and sixteen green LEDs are glued inside the hollow recesses in the base of each chess piece. The positive contacts for the LEDs are wired to copper washers attached to the base of each chess piece. The negative contacts for the LEDs are clipped to be made flush with the rest of the base. A conductive chessboard is made from a sheet of copper. The sheet is wired to the positive lead from a power transformer. Insulated holes through the center of each square on the board allow magnets to pass through. The magnets connect and hold a negatively wired steel plate underneath to the negative leads from the LEDs. Here is a video of this cool DIY LED chess set in action. If you want to make your own, head on over to Instructables for full instructions.